I'm struggling to achieve a "floating section header" effect with UICollectionView. 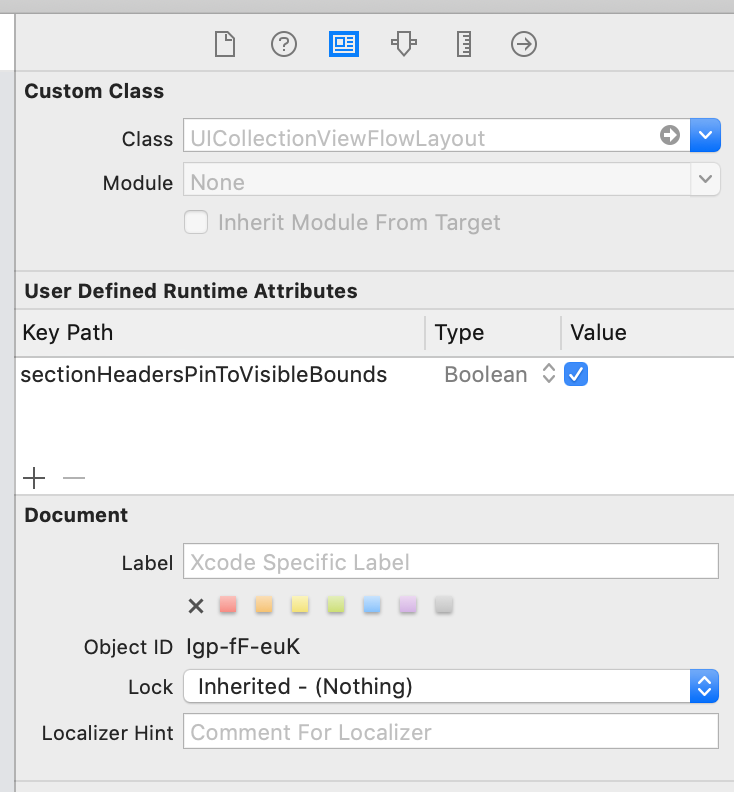 Something that's been easy enough in UITableView (default behavior for UITableViewStylePlain) seems impossible in UICollectionView without lots of hard work. Am I missing the obvious? However its not clear to me how to make the supplementary view float above the cells and "stick" to the top of the view until the next section is reached. Is there a flag for this in the layout attributes? I would have used UITableView but I need to create a rather complex hierarchy of collections which is easily achieved with a collection view. Any guidance or sample code would be greatly appreciated! Open the Identity inspector and add a user-defined runtime attribute with key path sectionHeadersPinToVisibleBounds, type Boolean, and the checkbox checked. The default header view has a transparent background. You might want to make it (partially) opaque or add a blur effect view. In iOS9, Apple was kind enough to add a simple property in UICollectionViewFlowLayout called sectionHeadersPinToVisibleBounds. With this, you can make the headers float like that in table views. Great answer! I'm guessing that answers above are only solution for pre iOS 9? Here is my take on it, I think it's a lot simpler than what a glimpsed above. The main source of simplicity is that I'm not subclassing flow layout, rather rolling my own layout (much easier, if you ask me). Please Note I am assuming you are already capable of implementing your own custom UICollectionViewLayout that will display cells and headers without floating implemented. Once you have that implementation written, only then will the code below make any sense. Again, this is because the OP was asking specifically about the floating headers part. I am using this code in prepareLayout, since I do all computation upfront. don't forget to override shouldInvalidateLayoutForBoundsChange to true! Not sure what this means, the code is incomplete and the notes don't fill in all the gaps. @RandyHill This code isn't meant to be a generic solution, rather it's a guide towards how I achieved floating headers. If you have trouble understanding any part of the implementation, just ask. (I'll add an extra note, which I think is the source of your confusion). Never mind, this is clear in relation to the question. I've removed my down vote. There is a bug in cocotouch's post. When there is no items in section and the section footer were set to be not displayed, the section header will go outside of the collection view and the user will be not able to see it. VCollectionViewGridLayout does sticky headers. It is a vertical scrolling simple grid layout based on TLIndexPathTools. Try running the Sticky Headers sample project. This layout also has much better batch update animation behavior than UICollectionViewFlowLayout. There are a couple of sample projects provided that let you toggle between the two layouts to demonstrate the improvement. I tried that. Actually if you already have a UICollectionView with a working data delegate, then moving to this is hard, because your datamodel must be modelled as an TLIndexDataModel. I gave up on this. @xaphod It does not actually. From the GitHub readme: "Requires TLIndexPathTools for internal implementation. The collection view itself does not necessarily need to use TLIndexPathTools, but the sample projects do." Yes, I read that too. In practice, it is not correct. Try it. @xaphod I should mention that I wrote the library. I'll look into adding a sample project that doesn't use TLIPT. The only requirement for using this library is that you've got to implement the VCollectionViewGridLayoutDelegate delegate methods, which themselves don't require TLIPT. The main intent of this library, however, was to work around some animation issues with flow layout. The sticky headers feature is secondary, so there may be better options for those only interested in sticky headers. I've added a sample on github that is pretty simple, I think. Basically the strategy is to provide a custom layout that invalidates on bounds change and provide layout attributes for the supplementary view that hug the current bounds. As others have suggested. I hope the code is useful. The header and footer views in this code behave differently compared to table view section headers and footers. They always stick even if scrolled farther than the end (so that it bounces). In your view controller that has your :cellForItemAtIndexPath method (just return the correct values). Or, instead of using the delegate methods, you may also set these values directly in your layout object, e.g. [layout setItemSize:size];. Using either of these methods will enable you to set your settings in Code rather than IB as they're removed when you set a Custom Layout. Remember to add <UICollectionViewDelegateFlowLayout> to your .h file, too! Choose "Custom" in Interface Builder for the Flow Layout, choose your "YourSubclassNameHere" Class that you just created. And Run! If numberOfItemsInSection == 0, you will get a EXC_ARITHMETIC code=EXC_I386_DIV (divide-by-zero?) crash on this line: UICollectionViewLayoutAttributes *firstCellAttrs = [self layoutAttributesForItemAtIndexPath:firstCellIndexPath];. I've also noticed that the contentOffset parts of this code are not respecting the collection view's top-inset value in my implementation (may be related to the previous issue).. Will propose a code change/gist/etc. Does not work for me, used your code by copy pasting. The headers are not sticky. My header is defined in the UICollectionViewFlowLayout class in the init method: self.headerReferenceSize = CGSizeMake(320,140). If it works for everybody else so there's something you're doing. Try declaring your headers in the appropriate Delegate method. Shouldn't this be doable without invalidating the layout on every bouns change? Thanks. I ended up using a separate UICollectionView for the sticky header, since invalidating layout on every bounds change with a collection view containing 1000+ items destroys performance. There is a bug in the code for the "if (numberOfItemsInSection > 0)" else clause situation. In that case the "- headerHeight" should not occur. I am willing to post the corrected code but am not sure a new answer is appropriate. I can't get this to work: in the [missingSections enumerateIndexesUsingBlock... part, often layoutAttributes is nil (it seems to get recursively called?). I am registering the class in the vc's ViewDidLoad, like this: [self.collectionView registerClass:[BHTimelineTitleReusableView class] forSupplementaryViewOfKind:UICollectionElementKindSectionHea‌​der withReuseIdentifier:SectionTitleIdentifier];... any hints? @cocotutch have you encountered any issues with using this since the iOS 8 SDK launched? My cell layouts within this Flow are defaulting to a size of 50x50 even though I've defined collectionView:layout:sizeForItemAtIndexPath:. More specifically, the inner cell content is 50x50, but the cell's size is still correct. Only occurs when building against iOS 8 SDK but running on iOS 7.0.X. Building against iOS 7.1 SDK and running on 7.0.X works fine. I ran this with vigorouscoding's code. However that code did not consider sectionInset. If you guys want code for horizontal scroll, refer to code aove. I ran into the same problem and found this in my google results. First I would like to thank cocotutch for sharing his solution. However, I wanted my UICollectionView to scroll horizontally and the headers to stick to the left of the screen, so I had to change the solution a bit. If you have a single header view that you want pinned to the top of your UICollectionView, here's a relatively simple way to do it. Note this is meant to be as simple as possible - it assumes you are using a single header in a single section. 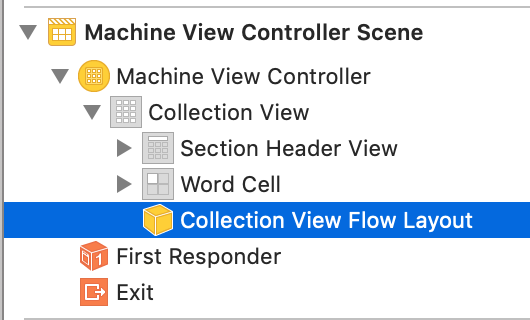 How can I add additional supplementary views to UICollectionViewFlowLayout with Swift? UICollectionView supplementary views won't animate "in" or "out"
[SOLVED] How can I set the entire header view to UICollectionView?